Chances are you know what a podcast is. And, based on our research, chances are you don't listen to them. Several years ago I got a portable digital audio player and began tuning into podcasts during my daily walks, while doing menial tasks around the yard, cleaning the house and otherwise. I began tuning into Car Talk episodes I was missing by not being near the radio at the prescribed time. When a local radio personality was let go by the local conglomerate station, he put together a podcast and I began tuning into that for additional entertainment as well. Photo: "Coming to you from the Crows Nest studio in beautiful downtown Broadview, Washington..." Our first in studio interview. 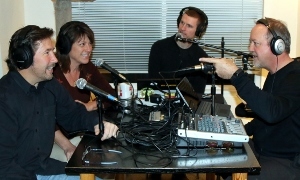 L-R: Tad & Gaila of Motostays.com, co-host Derek Roberts and SR! publisher, Tom Mehren. Photo by Pam Newsom. The idea for having a webcast for Sound RIDER! has crossed my mind many times over the last decade, but I could never fathom where the time would come from to allow us to put one together. Finally I found a way to do it. Call us slow to respond, but it wasn't until 2014 that Sound RIDER! had a presence on Facebook and Twitter. Once we realized we could migrate the efforts we put into our already existing News Bytes column across social media it all came together without having to allocate extra time to the process. And as a result the news feed you see today running in News Bytes is greatly improved and more informational than ever before without being long winded. It was that epiphany we had during the News Bytes/social media meld that led my mind to a place where I could grasp the reality of putting together a podcast. As we're out in the field doing interviews often with local motorcycle personalities anyway, why not record some of those and use them for content on the show? But seriously. Not a lot of folks listen to podcasts, we know this. Why is that? I believe there are three reasons. One, they don't grasp how easy it is to locate the content and bring it to their portable player. Today that is almost certainly the smart phone, which has superseded the iPods, Walkmans, Zunes, Zens and other portable devices you could listen to music and podcasts on originally. Today, typically with a single app, or just pinning a link to your start screen is all it takes. Secondly, many people don't understand the best time to listen to podcasts. Sure, you can play them while you're sitting at your computer working, but your attention span is nil, so you're better off just having some of your favorite music going on in the back ground during that time. The best time I've found to listen to podcasts is while doing something that requires very little brain power - like walking, running, working out, gardening, cleaning the house or hanging around doing nothing. Others listen to them while traveling, all be it driving, riding the bus or flying in a plane. And thirdly, some of us have tuned into podcasts only to realize they are, for the most part, amateur hour compared with top grade programs like Car Talk, Harry Shearer's Le Show and the Adam Carolla Show. While the fore mentioned shows are done with structure, the majority of podcasts are typically more a case of turn the mic on for an extended period of time and shoot from the hip. And from all I can tell, the masses don't find that too entertaining, including myself. So if Sound RIDER! were to have a podcast, what would it sound like? Recently we started developing the structure for such a program. Contentwise, it would be an extension of the magazine. A read on the calendar for instance, might reveal some additional information about an event and provide the listener with a better understanding about the events that happen locally in the Pacific Northwest. Using the News Bytes column/feed provides plenty of topics for discussion between the hosts and in studio guests. A local ride report is in order and of course; in studio guests as well as interviews from out in the field. And to keep it flowing and a little more interesting to the listener's brain, we'll feature some sponsor tags featuring the sponsors voices themselves, not ours, show ID's from local personalities and inject some humor here and there. Education - I want to the listener to be educated about their passion. As riders, we all want to learn a little something new. Enrichment - What a listener is learning from a show should enrich their life and what they get out of their interest in a subject. Otherwise it's time to tune out and move on. Entertainment - Indeed, we all want to be entertained. Two dry voices babbling in your ears for 90 minutes doesn't fit the bill of entertainment for the most part. So the goal as we move forward developing The Sound RIDER! show is to Educate, Enrich and Entertain. We may not hit the nail on the head in all three departments all the time, but the fact we're giving it a shot means you'll get more than most content available about motorcycling on the web today. And you'll certainly get a local look at your sport of choice not available anywhere else. Finally, we realize time is important. 90 minute podcasts are more than most people think they have time for. I'm one of those. Our goal is to create a once a month program that clocks in over 30 minutes and under 60. Our first episode will be released by February 2015. Watch for a "Show" link to appear in the top navigation bar on the site, then get yourself up to speed on how to play a podcast through your smart phone ( for the Sound RIDER! show it will be as easy as clicking the show link and then clicking 'Listen Now' on the Show page). We're interested in your feedback about things we can do better and things we do well, so please email us and let us know what you think.